“Overwhelmed by prayers,” Jesus Christ is urging folks to enlist the services of a customer service rep from Tacoma, Washington, who has promised the same level of service as people have come to expect from the Son of God himself, according to the Onion. This is my laser gun. it makes this noise. And is that poker cats contest effective at stopping online poker spam, I wonder? 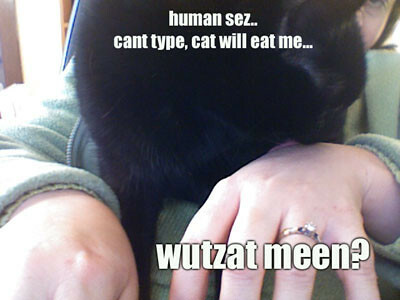 The amount of faith related LOLcats on I Can Has Cheezburger lately has been cracking me up. Feel the love. Click the picture and visit the blog. And on that note: whatever soap the church is using over in Wagner Hall? My cat loves it. She keeps licking my hand, to a point that I’m reminded of what happens when you try to erase your hand in grade school. OW. I don’t ordinarily blog about the specifics of my work. I can talk a blue streak about social media and whatnot, which just happens to be what I do for a living, but I generally keep my work self and my self self pretty separate in the blogosphere. But I would just like to mention that I have been appointed acting managing editor of the publication I do social media work for, effective later this month. 😀 It’s a temporary step back into print media editing that should be interesting. I’m a little nervous, though, because I still have to do my regular job. I’m weighing how this will affect my volunteer gigs. Week 3: Down two pounds. Weight watchers is fussing at me for losing too fast, but I made a rather drastic change in how I approach food and exercise and I’m really not regretting it in the least. I know there’s a risk of my metabolism slowing down, but I don’t think that’s happening. My energy levels are so much higher. I’ve asked DFH to take some before-pictures for me. As a faithful user of wordpress, both its open-source and hosted versions (and in both senses of the word faithful), I can even stomach the navy blue.